Oh, cool. The Patriots are in the Super Bowl again. Except the fun twist this year is that New England is going head to head with the Los Angeles Rams. So your choice, as a New Yorker, is to root for either the team that wins all the time, or... Los Angeles. It's like a would you rather, but the answer is you'd rather not. Or like a punt, marry, kill, but the only logical response is to punt them all. Of course, this is somewhat dramatic. Because if the quality of the playoffs were any indication, we could be in for a truly great matchup. When you don’t have a horse in the race, it’s easy to retreat into what’s comfortable: staying at home, ordering a nacho/wing/mozz stick combo, and sinking into your couch for the game. But don’t do that. It’s Super Bowl Sunday! Spectate like a champion. No matter what kind of fan you are, put some damn pants on and head over to one of these spots to bathe in the soft glow of LEDs and the communal excitement of The Big Game™Ⓡ. All right, Hollywood, here’s the deal. The Rams don’t have much of a presence in New York (or LA to be honest). There’s some evidence that American Whiskey is set to host Rams fans, but a southern gentleman whiskey bar near MSG seems like an odd fit. 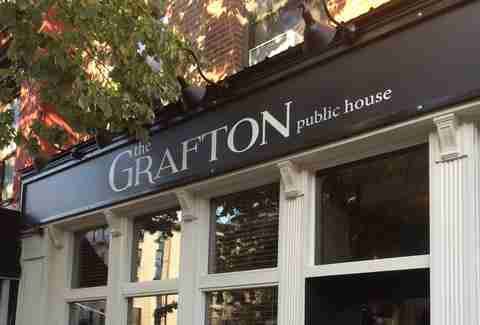 So go to The Grafton. 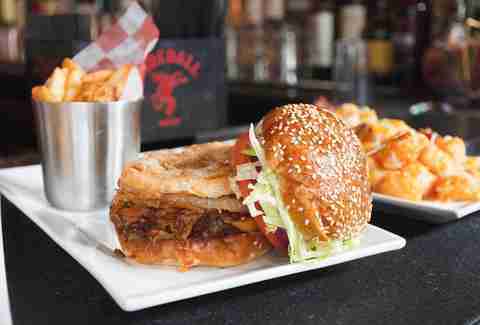 They’ve got beer and shot specials, 10 TVs with unobstructed views, a new menu featuring slow-cooked pork tacos. Will they be better than tacos in LA? Who cares! You wouldn’t admit it if they were anyway. 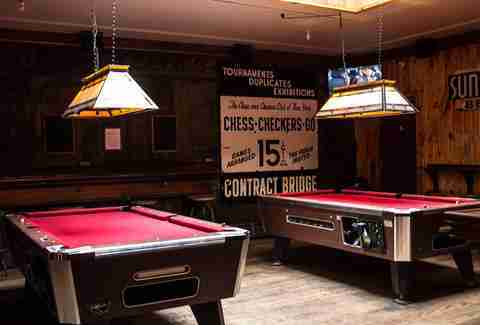 Sports bars present a sliding scale of options for most price ranges. You can find places with $100 all inclusives, or $300 table spend minimums. 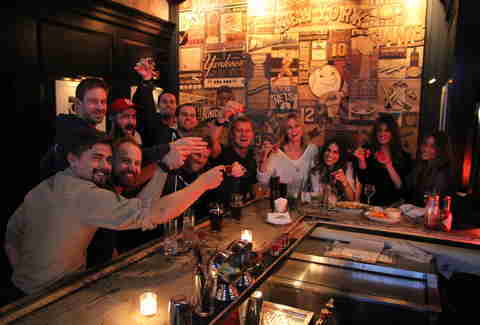 Or, you can hit a bar like Bleecker Street. This no-frills neighborhood joint in an otherwise expensive neighborhood will offer $5 wells and 24-ounce beers throughout Super Bowl Sunday, in addition to party subs and other snacks on the house -- while they last. So feel free to freeload, just remember to tip accordingly, ya cheapskate. Dat Packers season sure was miserable, aina? I’m sore-y it didn’t work out better for ya, but if it makes ya feel any better ya can still go to Kettle-a Fish to watch da Super Bowl. Der even doin’ brats fer da game (ed. while supplies last) so you can fill up on some sassage while ya watch dat pretty boy Tahm Braydee take on those hotshots from LA And juss remember, we only got about 200 er so days left until Aaron and da boys take da field again. In a matchup between New England and Los Angeles, why not head to a Chicago bar? 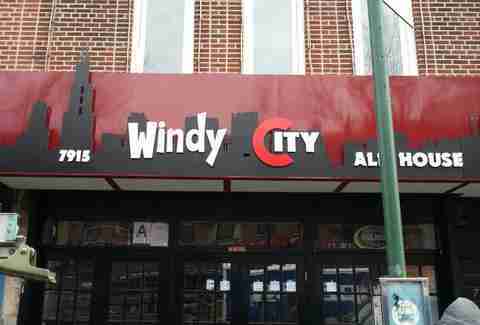 Bay Ridge is home to a number of solid sports bars, and Windy City Ale House is right there with the best of them. Enjoy a wide array of Goose Island beers, and Chicago staples like Italian beef, and the closest you can get to an authentic Chicago dog in town. Just don’t bring up Cody Parkey’s double-clanker and you should be fine. Do you like being a part of a society but don’t feel an obligation to contribute to it? All right Mr. Libertarian, I’ve got the sports bar for you. Bodega 88 on the UWS has personal TVs in each individual booth (first come, first served), so you don’t have to make eye contact with anyone while you enjoy the game. Plus, they offer some of the most unique food on this list, with Latin-inspired dishes (hello Angelinos) and four different types of wings, as well as a selection of craft cocktails. Rathbones has been a UES institution for more than 40 years. 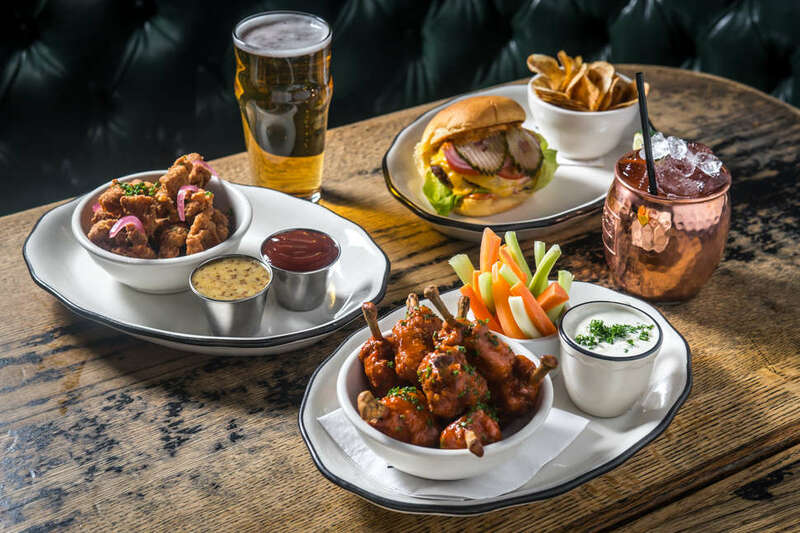 Sample the neighborhood fuss for yourself this while you catch the game on one of several television sets over some of the area’s best bar bites. Lots of sports spots try to razzle and dazzle with food or drink specials for the Super Bowl, but sometimes the winning combination is the classic: a pitcher of something light and domestic and a plate of wings slathered in sauce. No need to reinvent the wheel. 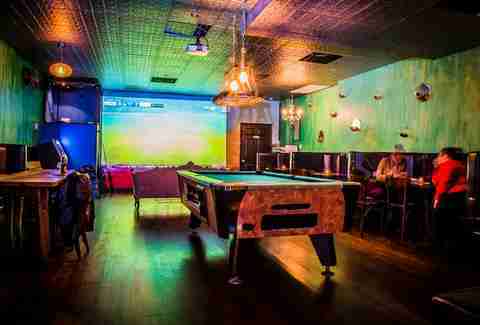 With 45+ TV’s, The Grayson is a behemoth bar. And its disco proclivities lend it some clubby flourishes that make it a go-to for energetic, Armani Exchange-clad sports fans. Expect DJ sets before and after the game, and table reservations ranging from $350-$600 (though normal seating will be available on a first come, first served basis). Grab a big ol’ plate of Totchos (loaded tater tot nachos) and then dance off the calories once the game is over. So you’re in town on business, you’re away from your friends -- frankly it’s kind of a bummer. But, you make pretty good money, so being stuck around the Times Square hotel they put you up in isn’t the end of the world. Take $100 and grab a ticket to Tonic’s Super Bowl party. You’ll get a happy hour open bar, wings, and an entree. With three levels and dozens of TVs, you’ll get a great view of the game surrounded by a couple hundred of your newest, closest friends. The Bushwick reputation of impossibly cool people that look cool and do cool things is not unfounded; but it’s also not the whole story. 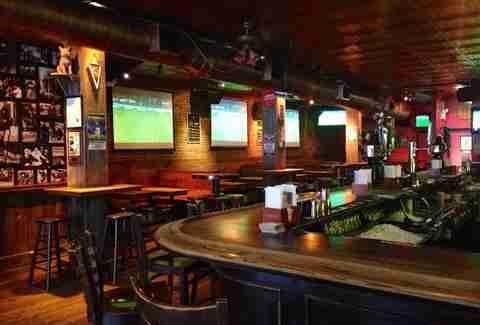 There are plenty of laid back, neighborhood bars for people looking to chill out and watch a game. Clara’s achieves a relaxed atmosphere, and knocks out a Super Bowl-friendly menu of burgers and wings. Plus it’ll be playing the game on a 7’ x 12’ screen, which isn’t so bad. Just good vibes all around, man. Lord knows you’re thirsty. Heck, I’m thirsty just writing this. The only question is, how do you satiate that thirst? They’re breaking out the big guns at Blind Pig. We’re talking 128 oz. beer towers, pitchers, and beer buckets. All the beer. All the time. Use it to wash down wings (with a choice of six signature sauces) and sliders, while you enjoy the game on 12 TVs -- including five big screens -- all with sound. 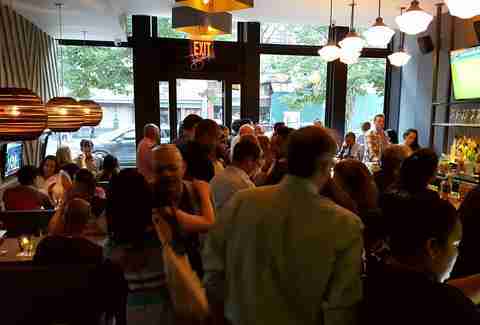 The bar tends to fill up though, so reservations are recommended. Are you tired of winning? Because we’re tired of you winning. Sure, you could go to noted Pats bars Tír na nÓg, or Professor Thom’s. But for the sake of the rest of us, we’d prefer it if you watched the game from the bar in the lobby of Trump Tower. It will be tremendous. 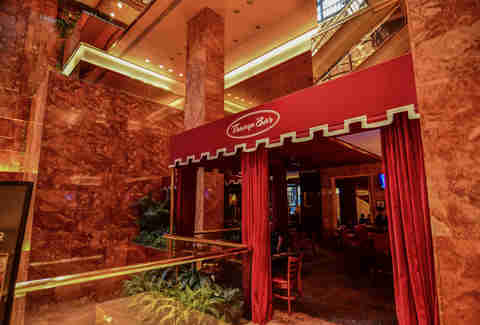 Drink a “You’re Fired” bloody mary, or a “Billionaire Martini” and leave the rest of us in peace. You’re probably going to win, and frankly the sight of your smirks on the train is already sending me into a blind rage.